"I finished seventh at the NCAA meet and everyone ahead of me was using steroids. I had friends at USC and UCLA. Their coach would give steroids out by the handful. But, [Payton] Jordan was afraid of all the long-term health aspects of steroids. I know three or four runners from UCLA who are dead now because they used steroids. Coach Jordan helped me stay drug-free." - 440 Yard Runner Jim Ward on his former Stanford coach Payton Jordan, who passed away this year at the age of 91. More from Ward: "Coach was the first person in my life I had met that had a moral and ethical balance. He taught me to focus and be confident." What is wrong with doing nothing with your life? Fernandez not in the fast heat at Stanford! Why is Galen Rupp Running The 800 at Stanford? *Outstanding Read: Lopez Lomong Gets His Brothers And Brings Them To The US This article is a once-in-a-lifetime read. Message Board Update: Bolt Doing Fine After Car Wreck Word from his agent Ricky Simms. *In-Depth Read On The Fallout From Bolt's Car Wreck Manchester meet organizers are worried about Bolt being able compete mid-May while others worry about the World's Fastest Man's lifestyle in the fast lane. New Shoes, New Marathons, And Bucknell Masters Keep On Truckin'. *Group Of Bucknell Masters Win American Odyssey Relay Their beloved former Bucknell coach Art Gulden would be proud. A Must See And A Must Bookmark - Amazing Marathon Research Published See the top 200 performances in the marathon from 1940-2008. There's an amazing amount of information on this site. LRC: The Week That Was We give you insights into Boston, London and Penn Relays. In between emphatically telling you whether Ryan Hall's start in Boston was too fast and wondering what Doug Logan thought of the US team's relay success at Penn, we ponder whether Kara Goucher should have run London and show you that Meb and Ritz aren't in the same class as Hall. Additionally, we present for the 1st time the LRC Maxim For Distance World Records. *Retest Nails Olympic Track And Field Gold Medallist For Blood Doping CERA A male Olympic gold medallist likely is going down. Seems most likely to be a distance runner. Glad to see the new test is nailing people and the cheats are still stupid. Anyone with a brain had to know they were going to test for CERA at the Games. Two unnamed Medallists busted and 6 overall. *Jamaica Dismisses Penn Loss In 4 x 100 As It's Revealed Asafa Powell Will Be Ready For Super Grand Prix On May 8th Powell was injured heading into Penn but said he wanted to run. Jamaican coach: "We ran 37.10 last year and we (Jamaica) will run 36 seconds in August." 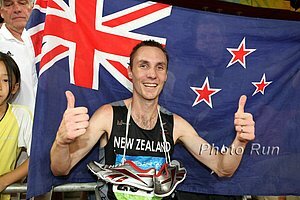 *Scotland's Andrew Lemoncello's 27:57 10k At Brutus Hamilton Excites Great Britain Much like Wejo's 28:06 excited all Americans back in 2003. "I used to play judo and the art of playing judo is take the force and pressure on you and return it to throw your opponent - and this is the moment for the Olympic movement to throw its weight behind that brand and reaffirm its values." - Seb Coe's take on how the Olympics fighting cheating in sports can be a model to fight cheats in all walks of life. *Phil Hersh Says It's A Good Thing They Caught Ramzi And A Good Thing It Wasn't Bolt Read the comments below his article to see how people react. *Jason Stewart Says He And Nick Willis Had Their Suspiscions About Ramzi ... and pretty much everyone else who follows running. *Seb Coe On Recent Frauds And London's 2016 Preparations Worth a read. *As A-Rod Gets Set To Return To Yankees' Roster, Book Claims He's Been Juicing Since High School Makes us glad our sport actually tests, bans and punishes its stars who are exposed as cheats. *Hasay Running 1,500m At Stanford She ran 4:17 last year. *Oregon's Preview To Payton Jordan Cardinal Invitational See what their studs are running. *It WAS Ramzi! Bahrain's Gold Medalist Rashid Ramzi Busted For CERA EPO After Olympic Retest Thread Here The LetsRun voters had this one with no problem as our poll shows that >70% of you apparently were never fooled by Ramzi's performances. See the 2008 Olympic 1,500m final results here. See our photo album from the Olympic 1,500m final here. *Great Brief Chat With Nick Willis The chat took place before the Ramzi results came out. *Kenya Names Their 10-Person Berlin World Championship Team Hello Sammy Wanjiru. Not sure why his name is on there, other than they really hope he runs for them despite announcing he's running Berlin City a little over a month later. 1. "The Bahrain Olympic Committee apologizes for receiving such news from the IOC since it ensured Ramzi went through all the necessary doping tests before the games and they were all negative." Well, isn't that wonderful. What does the Bahrain Olympic Committee do? Item 1: Buy athletes from other countries. Item 2: Make sure they're doped to the gills. 2. "I would venture that no Brit, apart from Radcliffe and Yamauchi, and certainly no British man will get near to winning London in at least the next quarter century." - Pat Butcher in his latest Butcher's Blog entry. 3. "I don’t see why I should take a path that would ruin me or my image. I don’t know if I’ll still be able to race, but I will always ride because cycling is my life." - Italian cyclist Davide Rebellin. Maybe you shouldn't have taken CERA. 4. "I know I am clean and have not done anything that would contradict that. I haven’t used anything different than I did in 2007." - Dominican weightlifter Yudelquis Contreras. Of course, they didn't test for CERA in 2007. *Recommended Read: Pat Butcher On Sad State Of GBR Men's Distance Running Lots of bashing of Britain's men's marathoners this week. *Brief Chat With Miling Stud Lee Emanuel If German Fernandez ran the indoor NCAA mile, Emanuel's life probably would be a lot different right now. He skipped 3:39 and 3:38 and went right to 3:37.99 last weekend after winning the indoor mile at NCAAs. *British Olympic Association Confident Their Athletes Are Clean Total media spin. The implied meaning: "We're confident most of our athletes didn't test positive or skip multiple tests this year." They were probably saying they were confident back when Dwain Chambers, David Millar and Christine Ohuruogu were getting banned and admitting to their offenses. Asafa Powell, Micah Kogo, Allyson Felix And Others To Compete At Reebok On May 30th Powell will bring in a big Jamaica crowd. Kogo just set the world record for the road 10km and won the bronze in Beijing. 2004 Olympic Gold Medallists: Justin Gatlin, Shawn Crawford, Jeremy Wariner, Liu Xiang, Felix Sanchez, Yuriy Borzakovskiy, Hicham El Guerrouj, Kenenisa Bekele, Stefano Baldini, Ezekiel Kemboi.